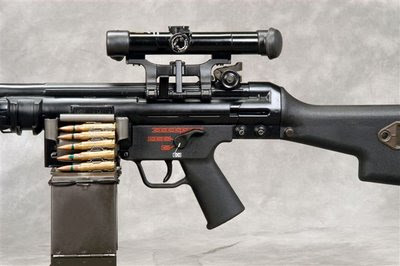 The HK21 is a German 7.62mm general-purpose machine gun, developed in 1961 by small arms manufacturer Heckler & Koch and based on the G3 battle rifle. 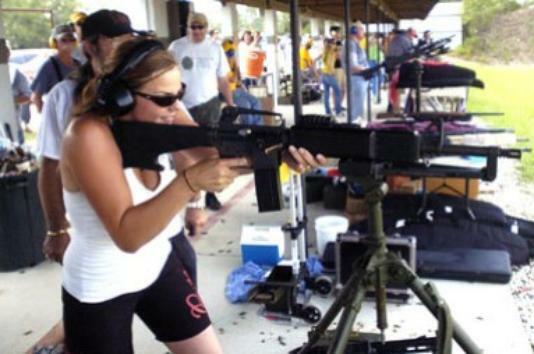 The weapon is in use with the armed forces of several Asian, African and Latin American countries. It was also license-manufactured by Fábrica do Braço de Prata in Portugal as the m/968 and in Mexico by SEDENA as the MG21. In the German military (Bundeswehr) and the federal police (Bundespolizei) it is designated "G8". 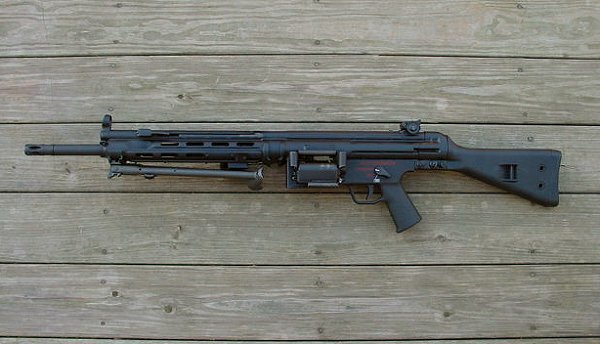 The HK21 is a selective fire roller-delayed blowback-operated firearm with a semi-rigid locking mechanism designed to retard the rearward movement of the bolt. This delay was achieved by artificially increasing the inertia of the bolt by using an angular, interposed transmission system, installed symmetrically to the bore axis, with two cylindrical rollers acting as transmission elements against a movable locking piece which drives the heavy bolt carrier. 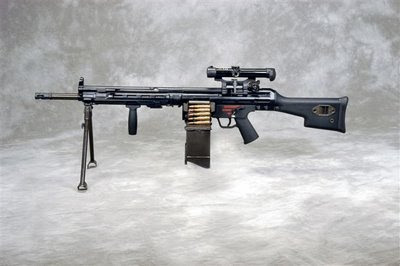 The two-piece bolt assembly consists of a bolt head, which contains the aforementioned rollers, and a supporting locking piece and bolt carrier. 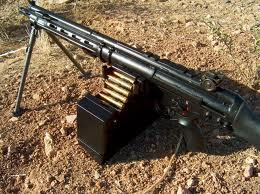 During the "unlocking" sequence, the bolt head receives the recoil impulse from the ignited cartridge and exerts rearward pressure against the rollers, seated in recesses in the barrel extension. The rollers are driven inward against angled ramps of the barrel extension and interact with the wedge-shaped locking piece, projecting it backwards. Thus a 4:1 transmission ratio is maintained (as long as the rollers move on the inclined surfaces of the barrel extension and locking piece) of the bolt carrier and locking piece relative to the bolt head; the bolt carrier travels backwards four times faster than the bolt head, ensuring a safe drop of pressure within the barrel prior to extraction. 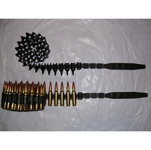 Since extraction is carried-out under relatively high pressure, the barrel’s chamber received a series of flutes designed to help free the bloated cartridge casing from the chamber walls. The bolt features a spring-powered extractor and an anti-bounce device that prevents the bolt head from glancing off the barrel extension upon forward return of the locking assembly. The lever-type ejector system is contained in the trigger group housing and is actuated with every shot by the recoiling bolt. The weapon has a hammer striker and is fired from the closed bolt position. 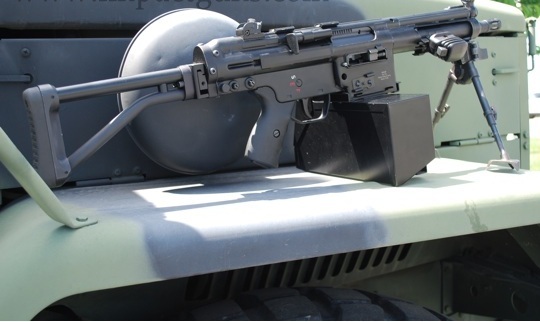 The trigger group, which is integrated with the pistol grip and hinged from the receiver, is equipped with a fire control selector switch (selector lever in the "E" or "1" position – semi-automatic fire, "F" or "20" – continuous fire mode) that doubles as a manual safety (rotating the lever into the "S" or "0" setting disables the trigger, weapon is considered "safe"). The machine gun feeds from the left-hand side through a variety of disintegrating ammunition belt types: the American M13 linked belt, the German DM6 counterpart to the M13 or the segmented German DM1 belt. The ratcheting wheel feed unit was designed as an easily removable module that is inserted into the bottom portion of the feed block (installed in place of the standard magazine well), below the barrel axis. 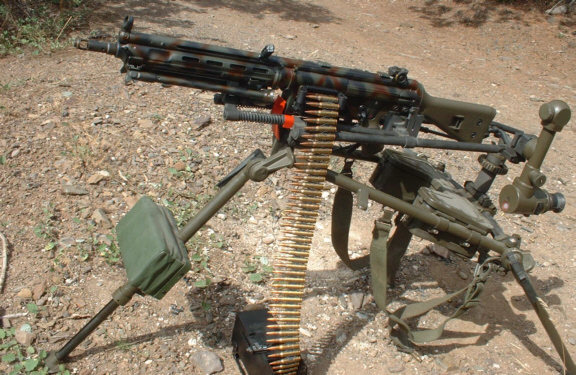 As a result of this configuration (the bolt passes over the belt), the ammunition belt is aligned upside down compared to most other belt-fed weapons (that is, the links face downward). The feed mechanism is actuated by the reciprocating movement of the bolt; a curved cam slot on the bottom of the bolt engages an actuator in the feed mechanism, rotating the double sprockets and positioning a new round in the feed path. 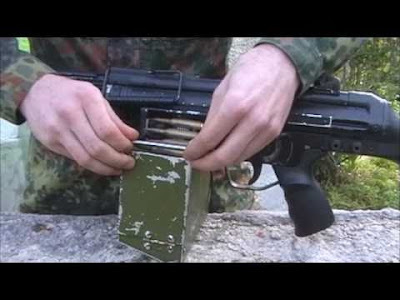 Simple conversion from belt to magazine feed is possible by installing an adapter in the feed block which enables the use of H&K’s proprietary 20-round box magazine (from the G3 rifle) or a 50-round drum magazine. 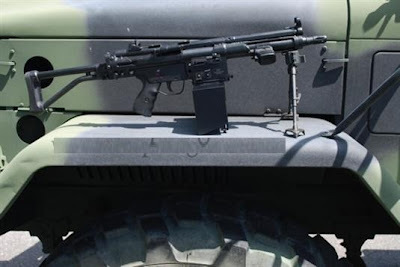 The HK21 uses a modified G3 receiver that has been extended to the front sight base and is equipped with a detachable bipod (mounted either in front of the feed mechanism or at the muzzle) and tripod and vehicle mounting points. 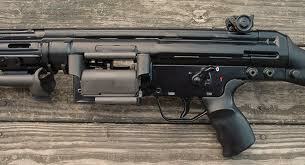 The HK21 has close to a 48% parts interchangeability with the G3. www.rdts.com. I see a lot of our HK21/21Ephotos from our website and Instagram with no credit from where they were found. Maybe it would be nice if the authors of this site give credit where it's due.